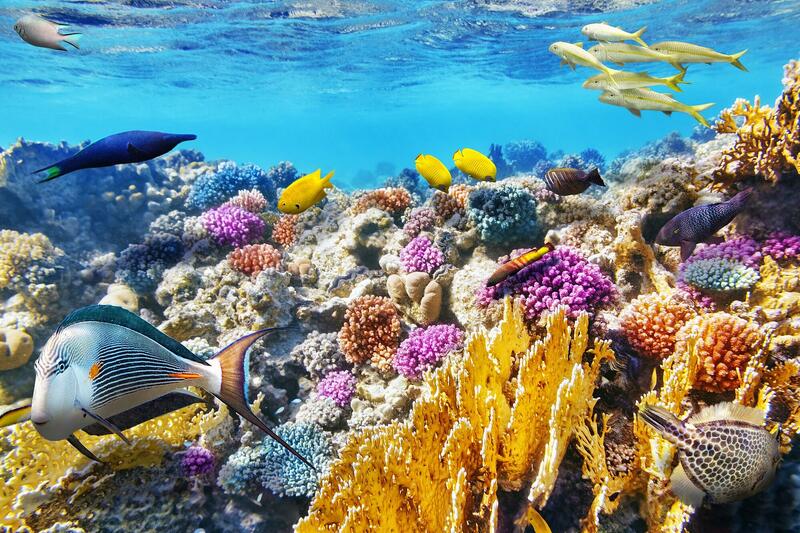 Belize is often referred to as one of the Seven Underwater Wonders of the World. The world's second largest barrier reef runs parallel to its coast, at distances ranging from a few hundred feet at the northern tip of Ambergris Caye to nearly forty miles at the southern-most tip of the country. 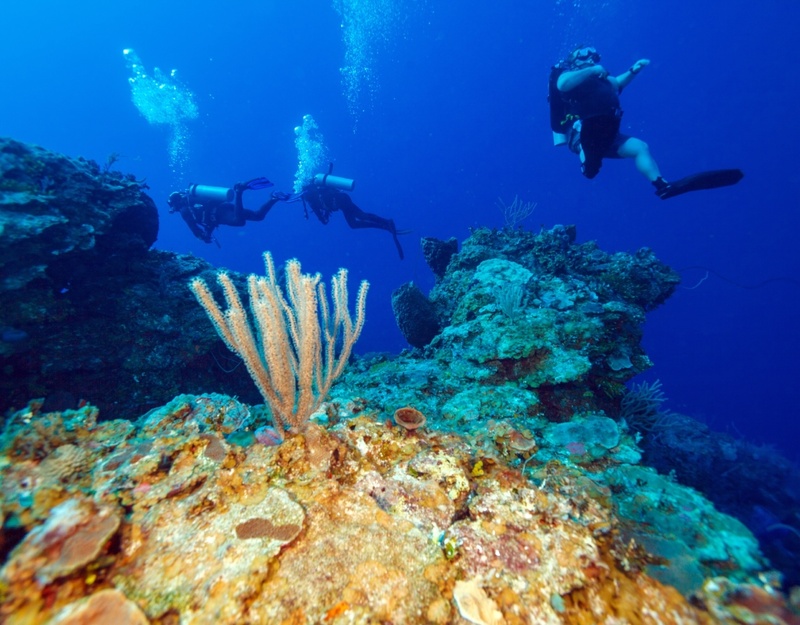 However, the barrier reef is not the only factor that makes Belize one of the world's most popular destinations for scuba divers and snorkelers. Many of the small islands, known as “cayes,” that lie off the coast of the Belizean mainland have their own coral reefs, with spectacular underwater gardens teeming with sea life of all types. The clear turquoise waters (which average 79-84 degrees) and the proximity of the barrier reef make Ambergris Caye a favorite destination for divers and snorkelers. The most popular destination is Hol Chan Marine Reserve, located 4 miles southeast of San Pedro. The ocean floor ranges from 5 to 35 feet, so both divers and snorkelers have the opportunity to swim in what seems like an underwater aquarium, teeming with colorful tropical fish of all sizes and types and beautiful coral formations. The "cut" (channel) leading out to sea functions as a sort of "fish freeway" for many large fish, including giant groupers, barracuda, and nurse sharks, a timid and non-aggressive shark species. Divers and snorkelers may enjoy a close encounter with a sea turtle. The rocks are home to many moray eels, who sometimes venture out in search of a meal. If you've ever wanted to try your hand at underwater photography, Hol Chan is the place! Other nearby dive/snorkel locations include Mexico Rocks, Palmetto Reef, Sandy Point Reef, San Pedro Cut, and Coral Gardens. A special favorite of both scuba divers and snorkelers is the Sand Bar, sometimes referred to as Shark and Ray Alley. Hundreds of sting rays of all sizes congregate here, often accompanied by families of nurse sharks. With a depth of only 8 feet, the Sand Bar offers great photo opportunities to aspiring underwater photographers and beginners learning to snorkel or scuba dive. The Sand Bar is not far from Hol Chan, and only a few minutes by boat from San Pedro. Known locally as “Sapodilla Tom” for the fisherman who first saw them near the Sapodilla Cayes on the southern end of the Belize Barrier Reef, whale sharks congregate at Gladden Spit every March to June. Shaped like an elbow pointing out to the Caribbean Sea, Gladden Spit is also a very important place for over 25 species of reef fish that come together at specific times of the year to reproduce, usually right around the full moon. Although some reef fish species reproduce in pairs or in small groups, dog and cubera snappers aggregate in the hundreds or even thousands to reproduce, known as spawning aggregations. During a spawning event, female and male fish rise in the water as groups, releasing millions of eggs and sperm. A healthy aggregation can produce hundreds of billions of eggs, and like the eggs on our breakfast table, they contain a lot of energy which makes this caviar very attractive to whale sharks. 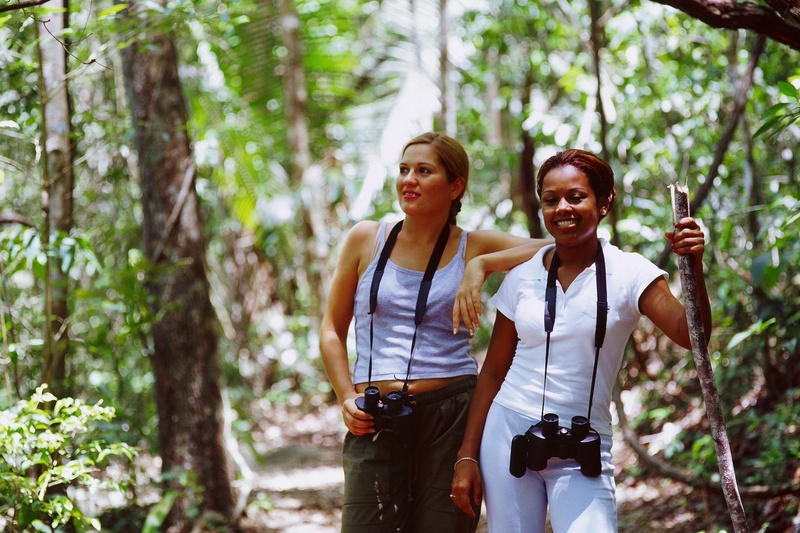 Like Costa Rica, bird watching is spectacular throughout Belize with over 540 species of birds in the country. Ambergris Caye is a bird watcher’s delight. 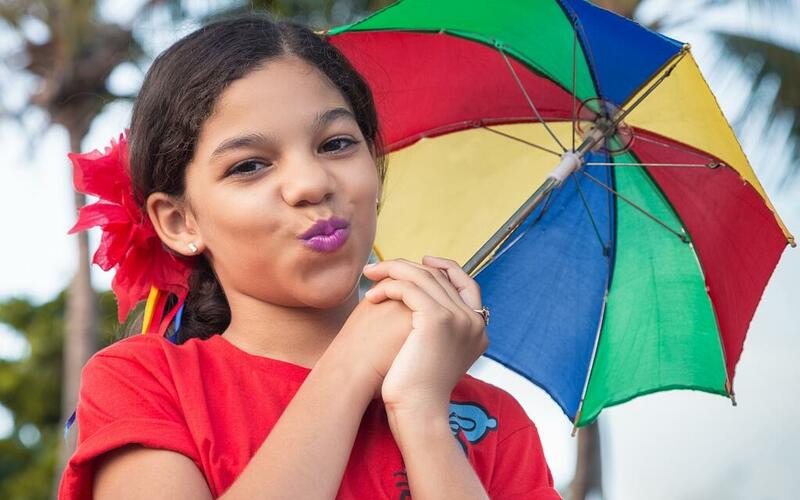 Given the right season, you might observe a red-billed cinnamon hummingbird, the chestnut-headed mangrove warbler, the mangrove vireo, black catbird, golden-fronted woodpecker, hooded oriole, tropical mockingbird, tropical kingbird, white-collared seedeater, and the boat-tailed grackle. Black hawks can readily be seen hunting land crabs. Even within the town you’ll hear the common ground doves, as they traverse the yards of San Pedranos. The best time for bird watching on the cayes is during September and October, when thousands of birds migrate south. Many spend the winter in Belize. Wading birds live on the cayes all year round, including: egrets (snowy, great, and cattle) and herons (green, little blue, and great blue). 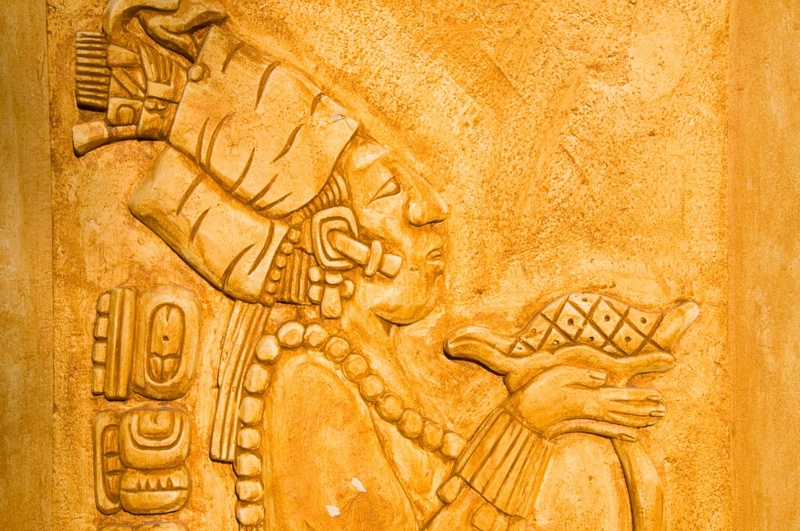 Recent discoveries and expanded analysis have led many archeologists and cultural anthropologists studying Mayan history to conclude that the center of Mayan civilization was, in fact, Belize! 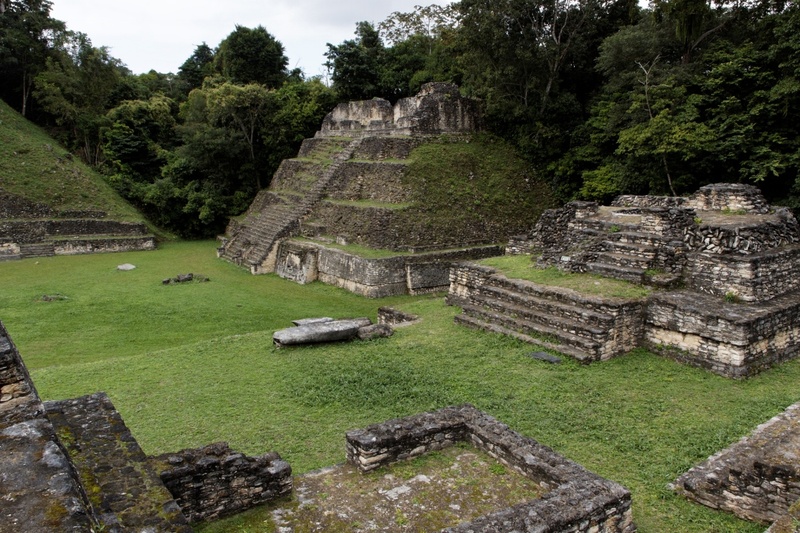 Belize is a treasure trove of ancient Mayan temples, towns and cities, only a few of which have been uncovered. Few visitors realize that there are remnants of several Mayans settlements scattered around Ambergris Caye. 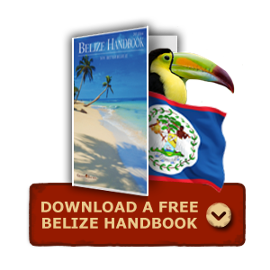 It is the only island in Belize with a protected Mayan Archeological Reserve. Excavations at the Marco Gonzales Mayan site indicate it was occupied as long as 2100 years ago. Surprisingly, this site flourished long after the end of the Maya civilization on mainland Belize. It’s possible the community persisted into the 15th century! The site is located about five miles south of downtown San Pedro Town. It has at least 53 buildings, with a central plaza and several small courtyard groupings. In 2008 a local group of island volunteers banded together to form a non-profit NGO to preserve and protect this site. A $1.5M US project is planned, eventually culminating in a Visitor/Educational Center. The center will be built next to the archaeological site. The Marco Gonzalez Mayan site is destined to become the number one “land-based” tourist destination on Ambergris Caye. Fido’s is the most famous restaurant, bar, and club on the island. It is an establishment that offers music every night. 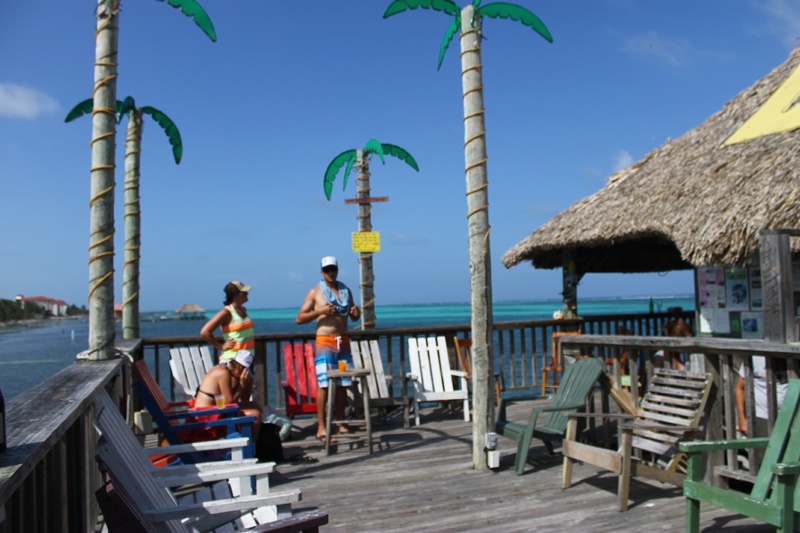 Crazy Canucks, at Exotic Caye Beach Resort, is another beach bar that often has great live music. Don’t miss Sunday afternoons at Crazy Canucks. From 2-6:30pm each Sunday you’ll find live music and an active local scene, with many musicians dropping in to jam. The patrons and visitors alike participate in the dancing on the beach. They also have live bands on Monday and Thursday evenings. 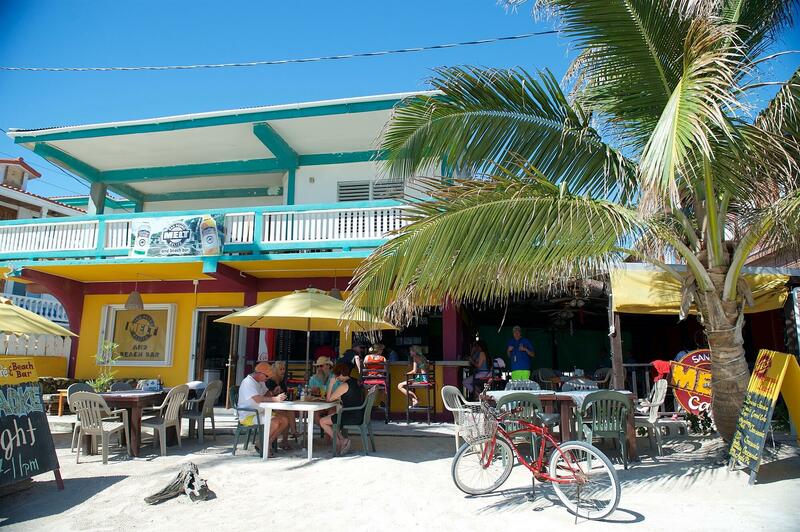 The residents of Ambergris Caye typically head out for BBQ on Sunday afternoons. After a leisurely Sunday lunch, many of the island’s residents head to a popular local establishment to listen to their favorite band. If so inclined, they dance to live music on the beach. Many of the local establishments have ongoing events. Karaoke is very popular at certain bars, like the Road Kill Bar, on specific nights. Others may hold poker tournaments (Pedro’s Inn and Pub), or Trivial Pursuit contests. The World Famous Chicken Drop is held in front of the Wahoo Lounge every Thursday night on the beach. 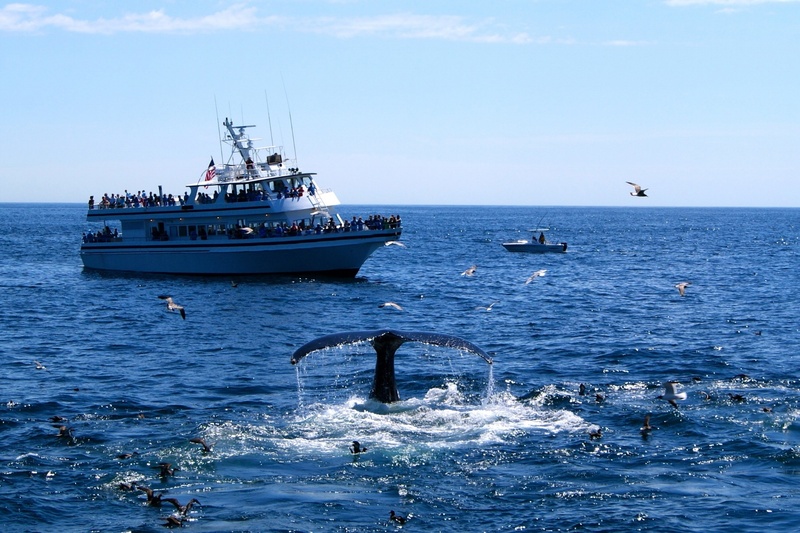 It is one of those wild and wacky events you will only find in San Pedro! Given all the free music, there is plenty of opportunity to dance. Some bands mix in blues and swing music in between their rock and roll rifts. So, swing dancers will find it possible to keep up their skills. Although there isn’t an abundance of salsa and cha cha music, there is enough Latin music to enjoy practicing these dances. It seems that at least once a week there’s a festival or a fundraiser in San Pedro (other than the slowest of seasons). Check the San Pedro Sun’s Visitor Guide for weekly events. It is available on Thursday afternoons. Most resorts have free copies on hand. Also, ask the expats who live here about upcoming events. They’ll know about the spur-of-the-moment competitions and fund raisers that are not advertised in the paper. Some of the popular events are those hosted by Saga Humane Society to raise money to care for the island’s animals in need. One of their popular re-occurring events is the cooking competitions that they hold every few months. Whether the chosen dish is a curry, chili, pasta, or appetizer, these events are fun, satisfying, and dedicated to helping a good cause. For the casino lover Belize has limited facilities - but they can be a welcome break from too much sea and sand. 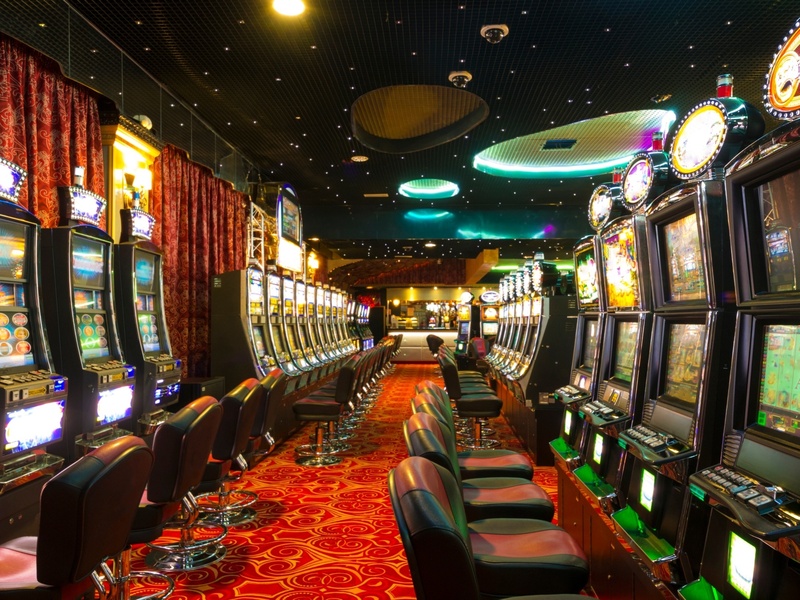 The biggest casino is in the Princess Hotel and Casino in Belize City - it's the nearest you will get to a Las Vegas style casino in this part of Central America. The Princess is located on the waterfront just off Barracks Road. The casino is on the right as you enter the lobby. It's glitzy, well-decorated and laid out with faux marble floors.